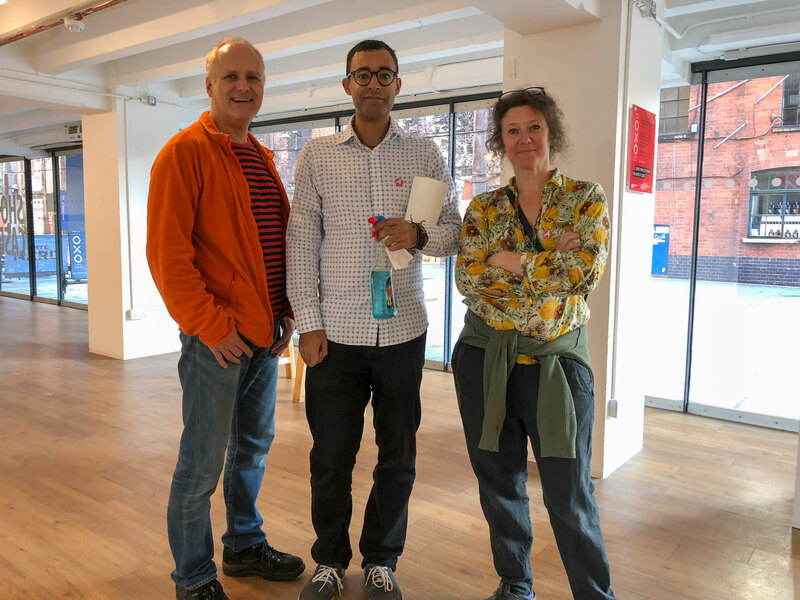 I was determined to get there on the first day of the SHOWCASE Exhibition despite the chaos caused by the combination SW Rail strike and a signals failure – and was very pleased to be their second visitor. The Oxo Gallery is in a busy tourist area so has the prospect of inviting many visitors. However, at first I thought it was an empty shop, waiting to be set-up, and almost walked past as the front display space looked quite bare. A good idea to have the OCA Timeline around the walls but I think that would have been better placed in the area at the back of the building. The concept of “Showcase” was the most important for me – to celebrate the multi-dimensional, creative work of so many distance learning students. I had been expecting to see artwork and photographs spread around the walls and to see small sculptures as well as be able to handle sketch books, photobooks and textiles, read and listen to poetry and music. That’s what I was wanting to see and to feel proud of belonging to a group of so many creative people who inspire and support me. Being met by the three smiling invigilators, Stefan, Johnathan and Sarah-Jane and then talking with Eddie from OCA office. 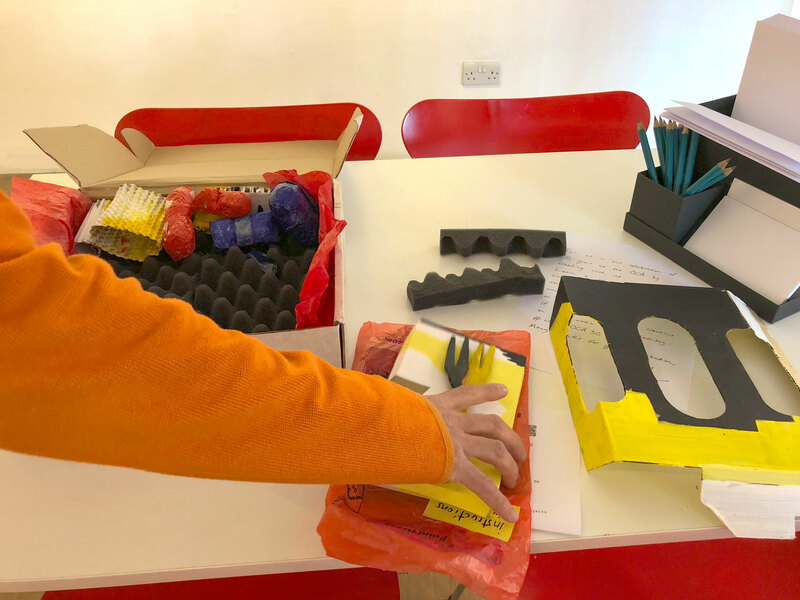 Stefan Schaffeld’s object-box was very inviting but it took me a while to accept his invitation to ‘unpack’ it. I was surprised what came up for me about making a mess of things and wanting to make sure that everything was put back in its proper place. How can I use this experience? I’m asking myself this due to being co-curator of the Exhibition being held by some of the members of the Thames Valley Group in February 2019. I enjoyed being able to handle and look at small sketch books and photo books and interact with Stefan’s object-box. It was also good to see video/film work projected on the walls at a larger size than on a computer. However, it felt odd not to see photographs, paintings, sketches, drawings on the walls. It could be that I’m just pre-conditioned to expect that in a gallery and sometimes the size of a gallery dictates what can be exhibited and how. A large gallery with separate spaces can offer more scope than just one room (which is what we will have in what is a fairly large gallery and well-known gallery in a busy Town). I certainly hope that Thames Valley Group will expand exponentially to include even more members from the other Art disciplines as I’m increasingly attracted by the idea of having larger multi-media Exhibitions. I hope that the OCA Student Site will show some videos and/or photographs of the Exhibition and the Private View. If you’ve been and read my review here please do leave a note of your own blog post on the visit. This entry was posted in 5. 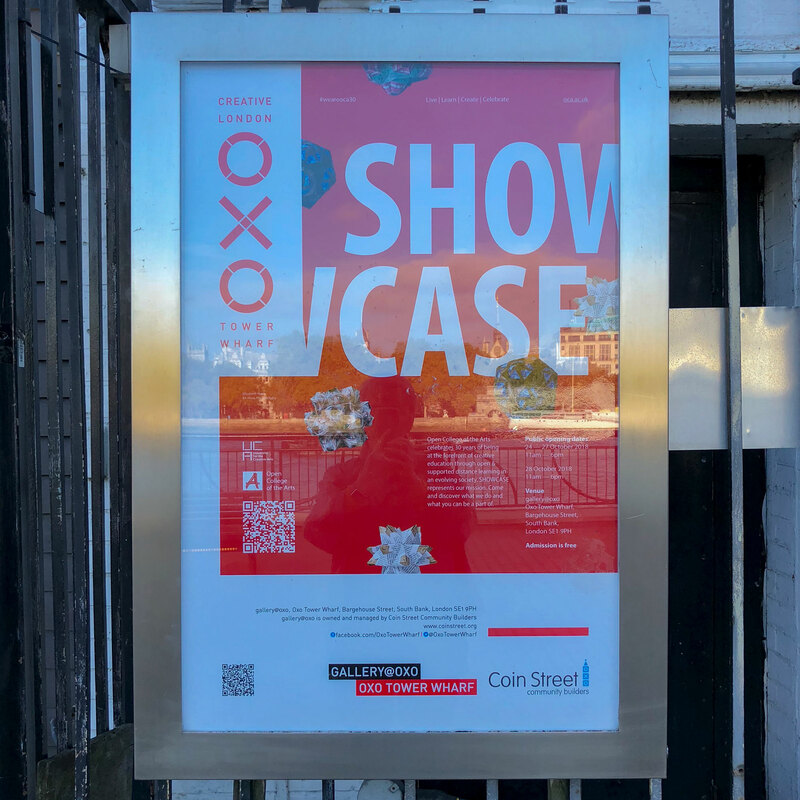 OCA Showcase, October 2018 on November 15, 2018 by Catherine. Typical that I was going away when this exhibition of OCA work was on, I really would have loved to have seen it. Interesting that there were no wall exhibits too, I do like to look at prints etc large scale & on walls. Hopefully there may be another one next year which you might be able to get to Judy. I can’t believe how bare it all looks. Its surprising that you had someone visiting before you. Are you coming to see out exhibition in Bristol? There was a lot of material in digital form and it took a long time to get through it all. I couldn’t see much of it at all at the PV because there were so many people walking across the projection line. I am purposely including that element in our SW show so that people will feel part of it. I got there not long after they opened and there were problems with trains so that could be the reason. I wonder what difference it might make with the Gallery full of people, it must have been quite distracting having to split your attention. I think I forgot to write as well on your blog re how good your idea is of people walking across the projection line – creating their own transitory mark. Thanks, Catherine. I am stewarding on Wednesday afternoon & will take my camera so, if there are any visitors then, I shall photograph them as they become part of the image. Here’s hoping we will get some! I agree with you that not having work on the walls seemed a little odd. And also, that it was really nice to be able to pick things up. I especially enjoyed flipping through the sketchbooks. Yes – there’s something special about small handmade books – the feel and look of them plus knowing that you’re holding an original.